Cologne – With the transfer window closing at the end of August, the Bundesliga has welcomed some new stars to its shores while also bidding farewell to several who have penned significant chapters in the league's history. 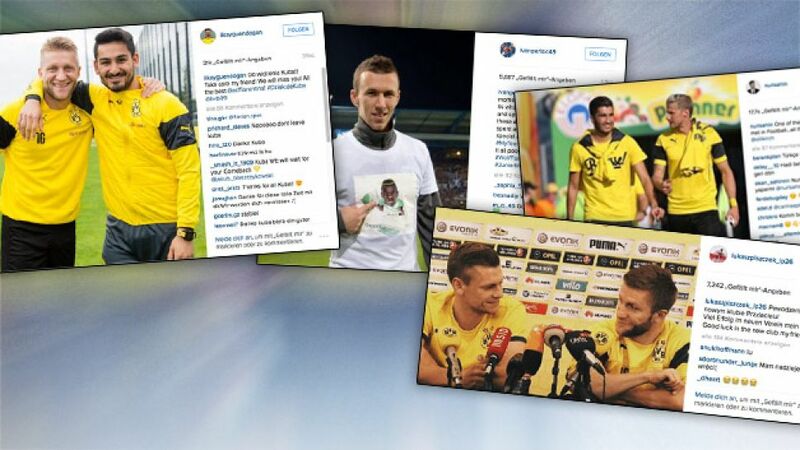 bundesliga.com takes a look at some of the social media reaction to the departures of players who have gone, but will not be forgotten. "I would like to take a moment to thank #VfLWolfsburg and the entire staff, manager #DieterHecking and sporting director #KlausAllofs for these amazing two and a half years I spent as being one of the #Wolves .. A special #ThankYou goes to #MyTeammates and to the #fans who made it all possible.. It has been my pleasure.. #WolfFamily #DankeSchön #IP9 #JuniorMalanda @vfl.wolfsburg"
"I had a great time with unforgettable experiences which will always stay with me. For three years I always tried to give my best for this club and play my part in the team's success and to take the chances to prove myself. I would also have liked to do this for a fourth year, but I would not have had these chances this season. Since I still have not lost my love for this sport by a long way, I sought a new challenge and am glad I found this with SC Paderborn. It's hard to say goodbye, but I am now looking forward to my new challenges. Thanks to all of the fans for your support, and of course big thanks to the team and the staff. I wish you all the best and good health! See you again for a battle in the cup!" Kevin Kampl said thanks to Dortmund as he looks forward to life at Leverkusen. Dear fans and friends, dear supporters of Borussia Dortmund, the time has come for me to talk about my future. But first of all, I feel it is important to say THANKS: thanks for the incredible support in the past 6! years, thanks for every positive and encouraging word, thanks for every photo and autograph I was able to give, thanks for every second I was able to play for this wonderful club, I thank every single employee, our coaches, with whom we spent 6 wonderful years, and all of my team-mates for everything. The biggest thanks, however, go to you the fans. YOU have always stood by me, YOU make this club something special, so remain faithful to who you are because "players come and go, but Borussia Dortmund remains the same". The numerous victories, amazing triumphs, painful defeats, derby wins, cups and titles, lost finals, injuries, every metre of grass covered, the cuts and bruises – I could go on and on forever, but there is one thing I have to say about all this: I never regretted a single moment and it was all worth it!!! Borussia Dortmund and I are parting company. Even if I would have played my whole life for the Black-Yellows, I have got to say that I feel lucky to have ever been able to play for MY club. Everybody knows that I am a footballer through and through, and I am grateful for this every day, but I need to be playing games, getting appearances and have the faith, like the air that I breathe… I am leaving Dortmund with one eye weeping but with the other smiling – because I am of course looking forward to joining an ambitious club with tradition and the sporting challenge at the highest level that entails, in order to prove myself to everybody, but above all to prove myself. A new country, a new culture, meeting new and familiar faces… I thank Galatasaray for this opportunity. FIFA have NOT given me my playing licence, but I am still going to move to Istanbul in the coming week and settle in. I will unfortunately only be able to prove myself in 'training'.